It is sometimes useful to calculate the RSI for a time frame different from that of the symbol applied as Data 1, i.e. 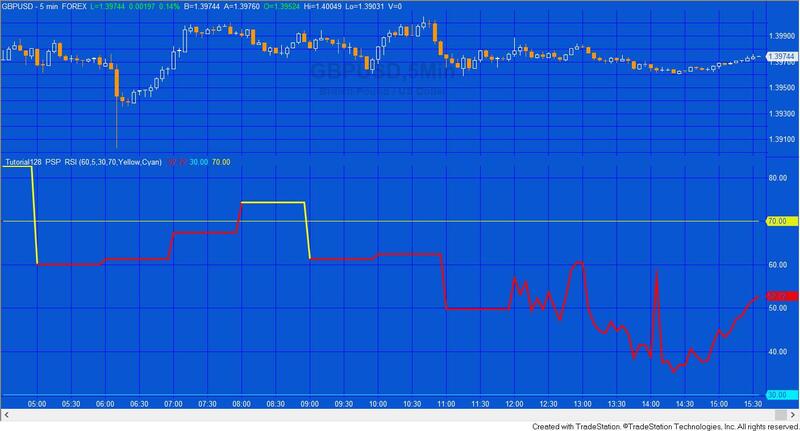 say you had a five minute chart but wanted to see what the RSI would be on a 60 minute chart. You could use additional data streams (data2, data3 etc) but this might not be convenient or possible. For example, if you use data2 then you could no longer use Intrabarordergeneration and it is not possible to use data2 with a tick, volume or advanced data chart. One solution is to use a Price Series Provider (PSP) as demonstrated in this tutorial. With most standard calculations on TradeStation we begin on the first bar of the chart and then perform the calculation on each bar moving forward. With a PSP we have the option to perform calculations by looking back at the data stored in the PSP. It is this technique that we will use in this tutorial. You might wish to compare the calculation in the TradeStation RSI function with the calculations in this tutorial. Please let me know if you see any errors or bugs. Bear in mind that, according to TradeStation, the closing of PSP bars and Chart/RadarScreen bars in real-time, are not synchronized. Therefore, the time stamp of PSP ticks (updated events) may not match the time stamp of data stream ticks. This can result in small differences between an RSI calculated. Gold Pass members can download Tutorial128_PSP_RSI for free. The UNPROTECTED TradeStation indicator (_Tutorial128_PSP_RSI) is available for IMMEDIATE download for $39.95- by clicking the ‘add to cart’ button. 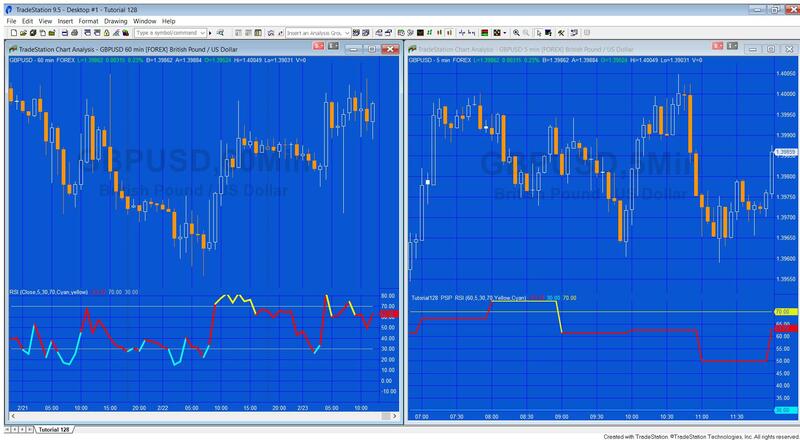 Gold pass members, make sure that you are logged in to download Tutorial128_PSP_RSI for free. Rather than talk through the program that has already been written, in the following videos I recreate the program in four steps. The spreadsheet in this video assume that, at the moment is is run, the PSP.Count is equal to 20 and we are using a length of 5.